Does sankarkarthik belong in this group? Golf nut I play twice a week. Does ironhorse2010 belong in this group? New and Loving Love it. I have played in two tournaments and have taken lessons. But still learning. Does zetalove2007 belong in this group? 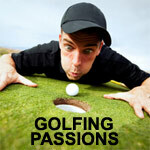 Golf Nut All in moderation just enjoy the companionship and playing the game around the world. Does vincent6 belong in this group?